نصرتی, شهریار, اخباری, محمد, سرور, رحیم. (1395). تحلیل موانع همگرایی ایران با کشورهای پیرامونی درقرن بیست و یکم و ارائه‌ی یک برنامه‌ی استراتژیک با استفاده از تکنیک SWOT و MCDM. فصلنامه جغرافیا ( برنامه ریزی منطقه ای), 23(1), 77-92. شهریار نصرتی; محمد اخباری; رحیم سرور. "تحلیل موانع همگرایی ایران با کشورهای پیرامونی درقرن بیست و یکم و ارائه‌ی یک برنامه‌ی استراتژیک با استفاده از تکنیک SWOT و MCDM". فصلنامه جغرافیا ( برنامه ریزی منطقه ای), 23, 1, 1395, 77-92. نصرتی, شهریار, اخباری, محمد, سرور, رحیم. (1395). 'تحلیل موانع همگرایی ایران با کشورهای پیرامونی درقرن بیست و یکم و ارائه‌ی یک برنامه‌ی استراتژیک با استفاده از تکنیک SWOT و MCDM', فصلنامه جغرافیا ( برنامه ریزی منطقه ای), 23(1), pp. 77-92. نصرتی, شهریار, اخباری, محمد, سرور, رحیم. تحلیل موانع همگرایی ایران با کشورهای پیرامونی درقرن بیست و یکم و ارائه‌ی یک برنامه‌ی استراتژیک با استفاده از تکنیک SWOT و MCDM. فصلنامه جغرافیا ( برنامه ریزی منطقه ای), 1395; 23(1): 77-92. In the 21st century, convergence is one of the requirements of the countries' globalization and establishment of global and regional lasting peace. Due to some barriers related to the convergence of Iran with Central Asian Countries and the Caucasus, including periphery countries, it is necessary to study and design suitable strategies about the establishment of convergence. 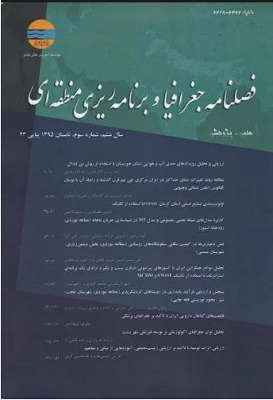 Therefore, using the mixed method (descriptive-analytical and survey methods) and multiple criteria decision making technique, the purpose of the present research is to answer the question that which strategies are the best strategies to improve Iran's role in its convergence with periphery countries according to the regional and international conditions in the 21st century. For this purpose and for presenting an applied strategic model using library and field studies and SWOT technique, 4 strengths, 4 weaknesses, 5 opportunities and 3 threats of Iran's convergence with periphery countries were identified and 8 applied strategies were formulated and the strategies finally were prioritized using MCDM technique through questionnaire and interviews. The results of the questionnaire of the pairwise comparisons show that the strategy "establishment of geo-economic links" has the first rank, followed by other strategies. Altamini, Naser(2012)China-Saudi Arabia Relations, June,The Middle East and PersianGulf study group. Andersen, Lars Erslev(2007)Postscript after Lebanon, A new Cold War in the Middle East, in Andersen: Inocence Lost. Islamism and the battle over values and World order, odense university press of southern Denmark. Cotori, Louis and Steven Spiegel(1970)The International politics of Region: A comparative Approach,New jersey: prentice Hall. Dennis,David. J & Yusof Zainal Aznam(2003)Developing Indicators of ASEAN Integration-A preliminary survey for Roadmap,Metropolitian Books press. Delen, D. , Turkyilmaz, A. , Torlak, G. , Uysal, O. , Ozteki, A. , Sevkl, M. (2012), Development of a fuzzy ANP based SWOT analysis for the airline industry in Turkey, Expert Systems with Applications, Vol. 39, PP. 14–24. Hale,William(2006)Christian democracy and akp:parallels and contrasts. edited by: Ali carkoglu and barry rubin. London-New York. routledge, Taylor and francis group. Perthes,Volker(2010)Turkish foreign policy in the Middle East: An outsider perspective. Insight Turkey. Walt,Stephen(1987)The origins of Alliances,Ithaca:cornel university press.